When beginning to walk on the path of an entrepreneur, one thing startups seem to struggle mostly with is getting their brand out there. In this saturated industry where new enterprises are popping up frequently in this competitive scene, making your brand distinguished from the rest can prove to be an obstacle. 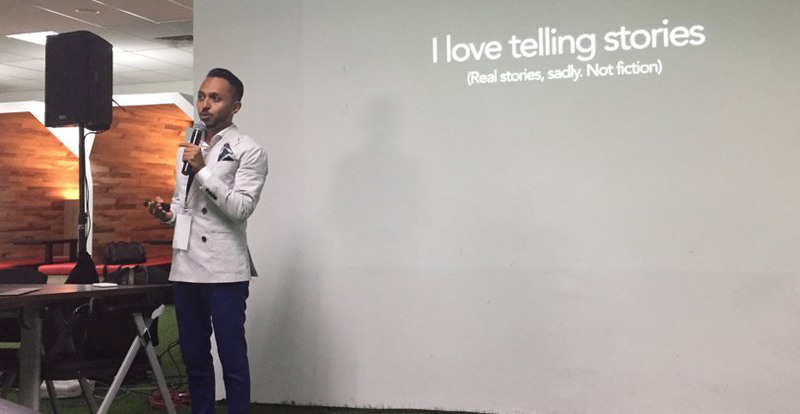 On the 1st day of MaGIC Academy Symposium 2016, Danish Farhan, founder and CEO of Xische & Co., held a talk called “How To Tell Unforgettable Stories About Your Product?” where he shared his insight and knowledge gained from 15 years of being an entrepreneur after going through many hurdles. But instead of opting for the simple deck of slides to share his history, he took a more personal approach and told it in story form. From being on the brink of going to prison to his accomplishment of helping Dubai Tourism gain its success today, Danish held true to his company’s purpose on helping innovate and design brands through the art of telling unforgettable stories. “Do you realize that brands can be just as interesting as a personal story?” he asked the crowd to start off his advice segment of his talk. So basing it on his definition of a brand being a strategy made visible, Danish explained 3 principles he’s learnt throughout his 15-year journey of entrepreneurship that he believes helped shaped his brand to what it is today. “Even half asleep, I expect you to be able to tell me who you are and what you do. 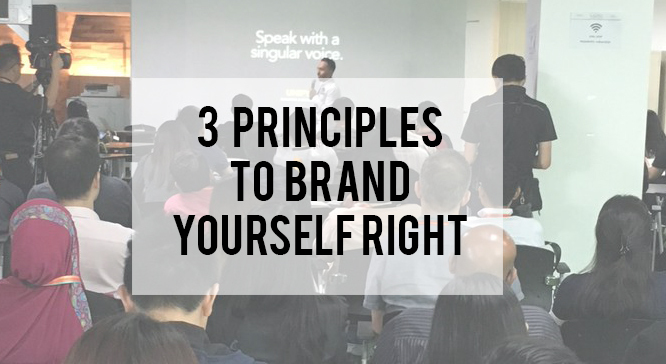 If you find the need to pull out a slide deck to present your startup to me, then that loses my interest which could be the same for your potential investors,” said Danish when talking about branding yourself. He goes on to explain three key points when it comes to unifying a brand. 1) Know who you are and believe it. When most people are starting something up, they pretend to be something they’re not, which is a mistake. It wasn’t meant as an intentional deception, but who you are and what you stand for should coincide with your brand to make it more solid and honest. 2) Learn to speak with one voice. As startup ventures go through the growth trajectory, a slight problem can arise where the more people join your enterprise, differences in opinions may occur. Co-founders typically work together because they’re different and can play off each other’s strengths. But when you stop talking like you’re in one accord, it becomes difficult to run your business because people will then not trust you nor believe you. It’s not about following a script but agreeing within yourselves what is it you stand for and how you pitch it regardless of your individual identity. Find a way to own the message. 3) Find the leader to become the public face. Just because you’re the founder doesn’t mean you need to be the face of your company. This is something some may find difficult to swallow. You may have a random nobody in your enterprise who just resonated really well with the audience and that person can end up being the face of your company. In the Fortune 500 list, only 10 CEOs really stand out, but does that mean the other 490 CEOs aren’t good? No. It just means they’re not extroverts or charmers but they’re still really good at what they do. So they allow others to take on the face of the company and that’s fine. Once the brand has been unified with a singular message, now comes the process of simplifying. Danish once again breaks it down into three key points for this step. 1) Have a clear and concise message. In one sentence, you should be able to tell me what it is you stand for and what it is that you intend to change. You shouldn’t need more than a few seconds to get the message across of what you do and why you do it. 2) Find a message that people can easily understand. Find a message that your colleagues, customers and even your dad can understand to make yourself more relatable. There are certain common experiences that unite all humans, or at least, all the people in a community. 3) Destroy anything that clutters your story. When you realise you have a perfect story, you get excited and write it all down thinking it’s perfect. However, you should also try to get someone who has never heard of you before to review it and ask them to only tell you what they think is important. This will help destroy anything that doesn’t help your principle story. It may be hard but you have to do it because what you may think is important may not be for others, and you only want the core parts to be told. A lot of startups make the mistake of skipping to this one first. Startups may wonder why the public may not be reacting to their purpose as much as they thought they would and it’s because they start with this step first when this is meant to be the end of the tunnel. Find a way to reinforce whatever it is that you promise with action. If you’re a company setting up a laundry service, the easiest way to go about doing this is going to laundromats yourself and finding people to engage with where you can give first hand info of your service. That’s an interesting way to pitch, but as a way of expanding your customer base, it’s slow and labour intensive. So what can people do? Taking a huge billboard and blowing up all of their stats or paying a celebrity or influencer to endorse the product might not be the best option. All these come with a hefty cost. What you can do instead, give consumers product A but also give them something extra. If you promise A, make sure you give A but also come back with a B as well. An example would be the case of a laundry service mentioned, which is a real case study. They gave the first 1000 customers a voucher for an UBER ride. There was no link between UBER and the laundry service but they know for a fact that people value UBER services. As it turned out, UBER didn’t even charge them for it because they wanted to be a part of that, so this became a symbiotic relationship where two needs were met. This is the ultimate way to make sure you are heard rather than blowing off your limited startup funds on advertising that may not necessarily generate the publicity that you want.